With a multitude of transfers in its sixteen year four month career D5242/25092 was one of the most transferred Class 25's, with allocations to London Midland, Eastern, Scottish and Western Region depots. April 1964 to Cricklewood West (14B). June 1964 to Leicester (15A). July 1964 to Wellingborough (15B). August 1965 to London Midland Midland Lines (LMML). February 1966 to Nottingham Division (D16). April 1967 to London Midland Midland Lines (LMML). August 1967 to Longsight (9A). 25092 appears to have been withdrawn whilst at Toton and noted stored there during June 1980. By October 1980 it had been moved to Derby Works and scrapped there by July 1982. 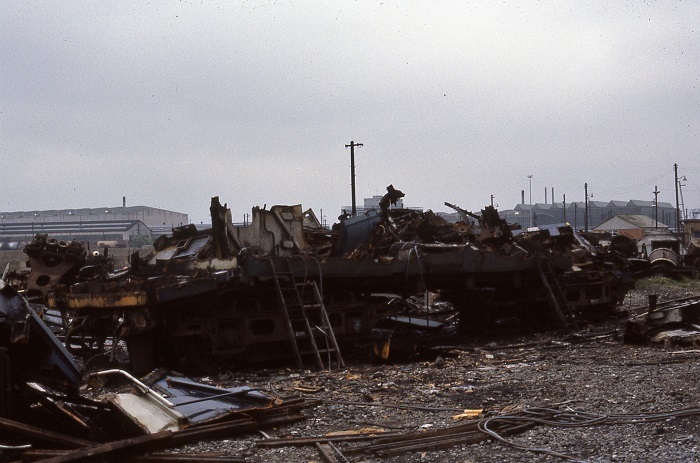 Photograph courtesy John Glynn Little remains of 25092 on June 23rd 1982 at the scrapping area within Derby Locomotive Works. Noted Crewe Works May 1966. Noted Derby Works ?? February 1975 and Glasgow Works ?? March 1975. Noted Derby Works December 1978. D5242 was noted at Doncaster Works on July 30th, being towed by D3161 with D2203 also attached. A boiler room grille was missing from the Class 25, who knows what repair Doncaster Works was trying to effect. D5242 was completed at Derby Works during the last quarter of 1963. On December 18th D5241 & D5242 made their Works test run to Corby. 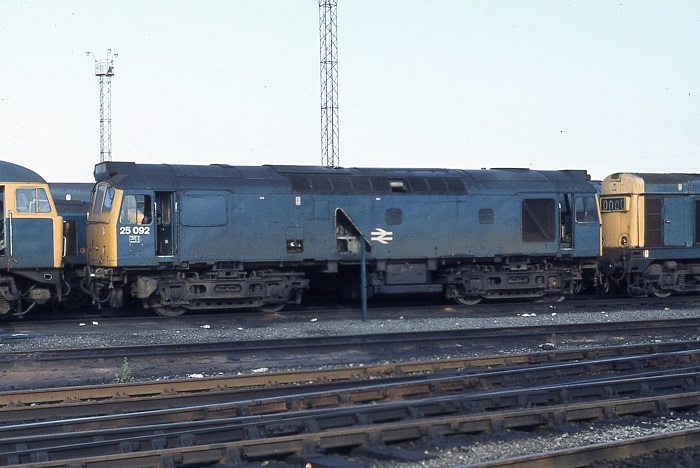 During September D5242 moved to Derby (16C), at the same time a number of her sisters were transferred to the Southern Region to cover a shortage of motive power due to problems affecting the Southern Region electric locomotives. If D5242 had been transferred to the Southern Region it would have been one of only a handful of Class 25 locomotives to be allocated to all five regions. The summer dated roundtrip Nottingham - Llandudno Town was worked by D5242 on September 4th. Moving to the Hunslet Works at Leeds on September 29th was Jubilee 45596 ‘Bahamas’ for a major overhaul. D5242 provided the power from Stockport Edgeley shed via Diggle, Huddersfield, Mirfield, Healey Mills & Normanton. The Jubilee had lain at Stockport since retirement in June 1966 after suffering a hot axlebox, purchase for preservation taking place during August 1967. During the middle of September D212 & D5242 were used for driver training between Stockport & Buxton. Condition September: two-tone green livery with full yellow cabfronts, no blanking plates, hand/footholds present, ridge sided sandboxes, three-rung bogie mounted footsteps, some stains from radiator water overflow. D5242 moved to Springs Branch, then the Liverpool Division (D08) during May to assist in the withdrawal of steam in the North West. On July 4th 5242 & 5243 were noted at Norwich presumably with one of the summer dated workings from the Midlands. On August 29th 5242 & 7501 (both in green livery) were noted at Derby with either the Skegness or Yarmouth service. The same pair were also noted at Blackpool North on an East Midlands services, presumably about the same time. Condition August: two-tone green livery with full yellow cabfronts, no blanking plates, hand/footholds present, 'D' prefixes present, considerable stains from radiator water overflow. The morning Carlton Sidings - Manvers Main freight could produce a wide variety of power, it was worked by 5236 & 7503 on June 24th and 5242 & 7512 on June 26th. On June 29th 5242 & 7598 worked the 02.29 Toton - Eastleigh throughout, the normal exchange of power at Banbury did not occur as there were no replacements available. The Type 2's returned on the 14.30 Eastleigh - Washwood Heath freight. Just over a week later on July 10th the 09.34 Nottingham - Lincoln St. Marks was worked by 5242 following a diesel multiple unit failure. On August 5th the roundtrip Nottingham - Llandudno Town was worked by 5242 & 5245 (assumed they worked both legs throughout). 5239 - 5242 were transferred to Tinsley during September. On July 6th the 07.35 Sheffield - Cleethorpes and the 11.35 Cleethorpes - Sheffield were worked by 25092. The transfer situation for this group of locomotives became very confused during 1975. February - 25093 & 25094 moved to Toton, by month end both are at Longsight. March - 25094 moves to Springs Branch. May - 25093 & 25094 move to Bristol. July - 25090 - 25092 to Eastfield. August - 25090 - 25092 do not stay long at Eastfield, 25090 moves to Longsight, 25091 to Bescot and 25092 to Toton. After all these individual moves 25091 - 25094 move to Laira. October - 25091 - 25094 to Haymarket. November - 25092 & 25093 go even further north - to Inverness - presumably their lack of boilers kept them only on freight workings. 25092 received its last Works repair at Glasgow during March. On July 5th a Glasgow - Scarborough extra, normally the province of a Class 40 was noted behind one of Eastfield’s newly arrived Type 2’s, 25092. The frenzied transfer activity of 1975 continued into 1976, especially for 25092 which was transferred to Eastfield, Inverness, Eastfield, Longsight & Toton. A new contract to move pipes from Leith Docks to several long distance locations including Derby, Wisbech and Salisbury, and shorter hauls to Carlisle, Darlington, Law Junction, Maud & Montrose would provide much work for pairs of Haymarket Class 25s. The Leith – Salisbury diagram involved the Scottish Type 2s working as far as Didcot, examples noted were 25026 & 25092 on April 24th, later noted heading north through Leamington behind 47107. On March 21st the 21.30 St. Pancras - Glasgow Central was worked between Carlisle (?) & Glasgow Central via Prestwick by 25092 & 25244. On July 22nd & September 1st the 21.40 Edinburgh - Carstairs was work by 25092. On April 14th a loaded Healey Mills - Barrow in Furness coal train and return empties was worked by 25092. The 08.00 Walsall - Yarmouth to Norwich and the return 14.15 Yarmouth - Walsall from Norwich were worked by 25092 & 25272 on July 9th. 25092 was active on the Glasgow Queen street - Dundee route during August being noted on services on 12th, 25th & 28th. At this time the locomotive carried a nasty dent under the 2nd man's cab window at the No.1 end. On September 14th 25092 handled the local trip working to the Metal Box sidings at Arbroath (Elliott Junction). The detailed reporting available from the TOPS computer system as well as keeping track of locomotive movements allowed a detailed look at works shopping and maintenance histories. As 1979 closed eight Class 25’s were overdue for either intermediate or general overhaul. The most delinquent was 25092 which had been scheduled for an intermediate repair in December 1978, instead it was transferred to Cricklewood during December! 25092 was withdrawn during May from Cricklewood, being initially stored at Toton, finally reaching Derby Works during September. Photograph courtesy Adrian Healey 25092 has been withdrawn for several months and is seen here at Toton on August 31st 1980. 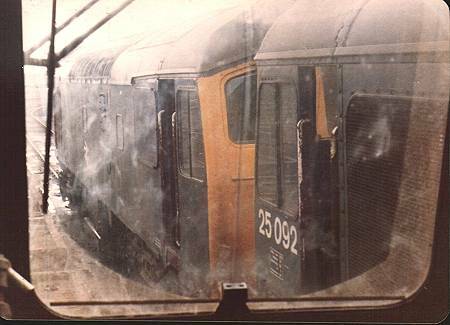 Photograph courtesy Mark Bennett 25092 & 25094 from the cab of another Class 25 at Derby Works. At the beginning of August Swindon contained thirty nine Class 25’s whilst Derby Works finally broke up the remains of 25295 which had been withdrawn back in June 1978, the honour of being the longest withdrawn now passed to 25092, retired in May 1980 and also at Derby. During June the honour of being the longest retired Class 25 passed from 25092 (withdrawn May 1980) to 25023, as the former was broken up at Derby. No.1 end 2nd man's side, a nasty scrape under the cab window and missing yellow paint from low down on the cabfront, from at least August 1978. Page added September 1st 2004. Last updated March 21st 2019.